If you missed yesterday’s post with the 1st part of our birthday party fun, you can catch up here. The kids really had a ball at My Gym with the staff and all the train themed activities that were intermingled with their free-play time during the 2 hour fiesta. Stephen & I honestly didn’t have to worry about anything. It was perfect! Bubbles — Bubbles — Bubbles Everywhere!! It’s a “train wash” 🙂 …this was so cute! The kids could ride through the bumpers to “wash” their “train” with the bubbles….lol. Gotta love that. Very creative! This is a few action shots of another creative activity. Just before this, all the children were sitting in a circle on the carpet, and Ms. McKenzie told them that one of the train’s, Diesel, came by and made a big mess. Ms. Kendall then scattered all these bean bags , balls, and pom poms across the gym while they had their eyes closed. The kids were then asked to help clean up the “train yard” by putting each type of item together in it’s own bin (e.g., all the bean bags in one bin, all the balls in another, etc.). Way to go, Kenadie! Great balancing! 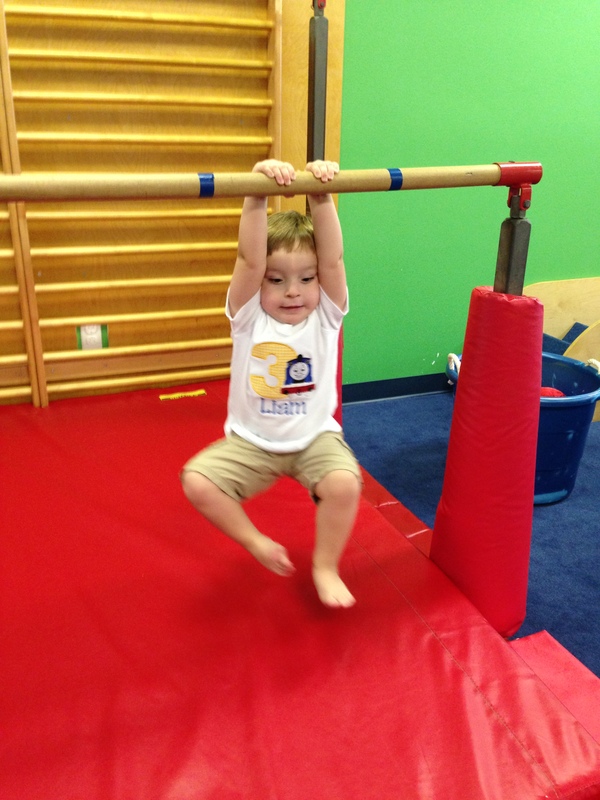 I caught this little gymnast hanging from the uneven bars like this several times. Ha! Perhaps he is trying to tell us something? The ball pit was a huge hit with all the kids! Below, Crosby was getting a kick out of his big sister Kenley playing around. Trampoline! This was the very 1st thing Liam ran over to once he got into My Gym. The ladies at the gym even complimented how good of a jumper he was….haha! Activities ended with this super fun ride on the zip line! Liam actually did not enjoy it that much, but he had just taken a little spill just before this began so I think that played a part. Poor little dude. What a great celebration for this little man! We could not have asked for a better time. To everyone who came out to play with us — THANK YOU!! It meant so much to us and to Liam. He really did have the best time. To others who were not able to make it there, but celebrated in spirit and/or helped out in other ways, we thank you, as well, and you know who are!! We could not have asked for a better 3rd birthday celebration!! So blessed. Um…excuse me? When did Mr. Liam turn into a little man? So cute! I know, Kelly 🙂 …He is growing way too fast! I need to find a way to pause time!